Aluminium Stewardship Initiative (ASI) today announced Hydro Aluminium Rolled Products to be successfully certified against its standards for responsible production, sourcing and stewardship of aluminium, and the issuing of the 20th ASI Certificate. Hydro is one of the worlds’ leading manufacturers of technically advanced rolled aluminium products and solutions, with a strong production base in Europe and a global reach. 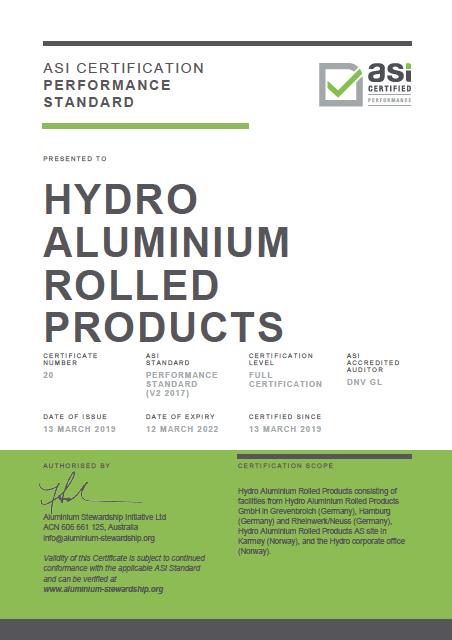 View the Hydro Aluminium Rolled Products Summary Audit Report.